Five days ago I signed up for a self-care initiative. It's done by the guy I've been following for years for fat loss. He has always said that in order to change your body, you have to change your mind. So now he offers a course on how to change your mind. I started on Saturday and, while it still seems fairly easy, I can see we are heading into some deep, deep waters. 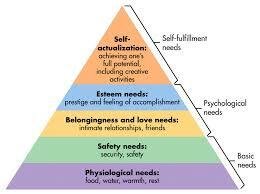 Yesterday's assignment was to look at Maslow's Hierarchy of Needs and view our lives in terms of the different levels. Overall, I'm pretty okay on this level. I have enough money to buy food and keep a roof over my head. The problems I have at this level are definitely 1st world problems. I eat junk food far more often than I should. I don't dring enough water at times. These are things that are purely self-inflicted and things that I can easily fix myself to make this level solid. Again, the issues here are definitely 1st world problems. I am not secure about money because we live paycheck to paycheck, but I am working on changing that. I worry about retirement and how that will work for me. I worry that something may happen to one of us and then what will happen to the other one. But again, these are all things I can fix myself and I am working on some of these issues. This one is where things start to get shaky. While I feel I have a strong marriage, we are not as close or intimate as we used to be. That though is easy enough to fix and totally within my power. Friends, now that is a different story. I have a couple of good friends and I have some acquaintances. But they are few. I have trouble making friends and keeping friends. Part of the problem is I don't need a lot of friends, that's just not who I am, but I also think I'm too honest in some ways. If people want to do something and I don't, I say no. If there is some activity that just doesn't appeal to me, I won't do it. I know that some people have the ability to go and do things whether they want to or not just to be with their friends. But then is that really fulfilling their needs or just letting people control them. Hmmm... that's a rabbit hole I'm not sure I want to go down. Yeah, this area is a problem. I do not feel that I have the esteem or the prestige that I should have for 10 years of teaching. 10 years of teaching is a long, long time. I should be a teacher that other teachers look up to. I should have things wired, well as wired as you can have teaching. I should be the one that is on the leadership team. I know what I'm doing. So yeah, this area is definitely where things start to fall apart. And this just continues it. I know that I am not living up to my full potential. I know that I could be an amazing teacher if I put the time and energy into it. I know that I could be an amazing leader in the field of science teaching if I just put in the time and energy. I know that I could be an amazing dog trainer and make Mavy an amazing dog, but I need to put in the time and energy. I am a smart, talented, extremely creative person who just does not live up to her potential. There are lots of things I don't do in my life that I want to because I'm not willing to put in time and energy. I could be amazing at the things I do if I would just focus and put the time and energy into them. The thing is, I know that if I made myself do amazing things in one area, that would rub off and I would do amazing things in other areas. I don't even push myself on the things that I do. I've been taking Mavy to training for a year now and I don't practice with him near enough. Hell, I've been teaching for 10 and I still stumble through days like I don't know what I'm doing. It's stupid. So clearly I have some things to work on. I'm hoping that this class will help me work those things out.